Men who train with weights and use whey, do not become stronger or more muscular due to their supplementation. But according to Portuguese researchers, affiliated with the Escola Superior de Tecnologia da Saude de Lisboa, whey supplements lower their fat percentage. The researchers examined 49 men aged 18-35 who had been training with weights for some time. 26 of them used daily supplements with whey. In this group the intake on whey protein was on average 41 grams per day. The remaining 23 men did not use whey. Both groups consumed a relatively large amount of proteins, but in the whey group protein intake was significantly higher. In the whey group, on the other hand, the intake of carbohydrates was somewhat lower. When the researchers determined the maximal weight with which the men could squat and bench press, they found no differences between the groups. This also applied to men's lean body mass - say: their muscle mass. However, supplementation did have an effect on fat mass. The men in the whey group had significantly less body fat and a significantly lower body fat percentage. The men who used whey consumed as much energy per day as the men who did not use whey. 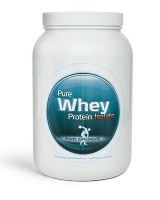 The researchers therefore do not think that whey decreases appetite, and that this explains the difference in fat mass. Instead, the Portuguese think that the men in the whey group are leaner because a protein-rich diet stimulates the body to convert more nutrients into heat. "If the main goal is to promote fat mass loss, [...] either due to aesthetic, health or performance reasons, whey protein supplements may be an effective dietary strategy", write the Portuguese. "Further research should clarify which amount and type of whey protein, as well as timing of intake (throughout the day, before or after training), has more beneficial effects on whole-body and regional fat mass." Adding fast carbohydrates to whey has no positive effects on muscles, but does delay the decrease in fat mass. If you want to tone up you'll have to a. get more exercise (preferably resistance training) and b. eat more protein. Nearly everyone who goes to a gym can tell you that these two factors have a mutually reinforcing effect on each other. Higher doses don't work any better, Australian researchers discovered.